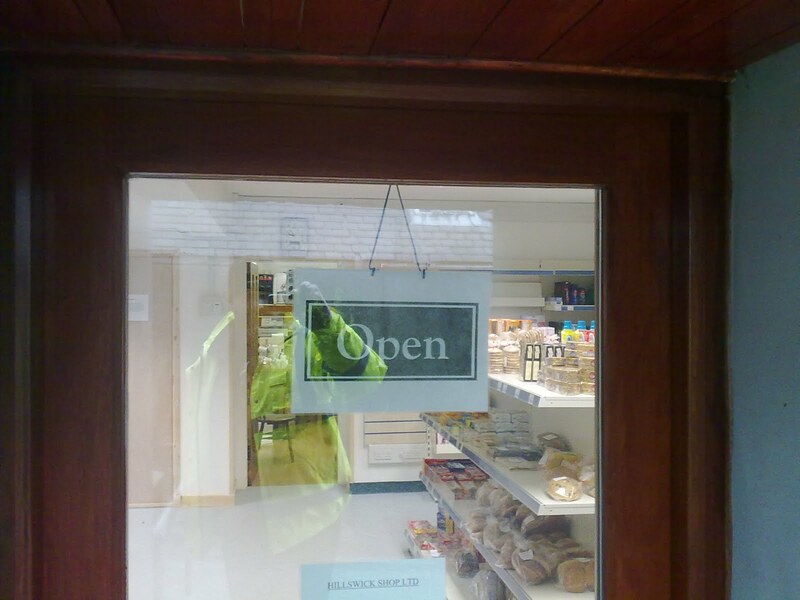 After a shopless year, Hillswick's community store is open! Hillswick's local shop has been shut for a year, and its absence has been absolutely awful for our remote wee island community. No access to bread, milk, coffee and all the other things you always forget to buy either in Lerwick (35 miles) or Brae (10 miles). No Shetland Times on a Friday morning. No diesel, petrol or last-minute bottle of Buckfast/claret/champagne. The Post Office, once open every day at the shop, is down to two useless (for me) afternoons a week at the community hall. It's hope that the Powers That Post will see sense and give us back our eBay outlet. Because this week the shop reopened, and this time it's a community-owned enterprise. The building was bought by local development organisation the Northmavine Community Development Company, and nearly all the renovation work (roofing, flooring, shopfitting, external concreting) has been done by local volunteers. Three jobs have been created and inside it's a beautifully fresh, clean and cheerful delight. I've been in twice so far, and on both occasions got involved in the kind of local chit-chat visits to 'da shop' have always involved. Now what we have to do is make sure the shop is a continuing success, which means using it. Or losing it. It does, after all, belong to all of us. 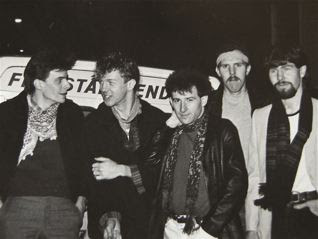 I'd promised an old friend, Brian McGlynn, that I'd find a couple of pictures taken back in the days when I thought I was a bit of rock'n'roll photographer..1983 or thereabouts. Both show manifestations of the band Woza, originally formed by Brian and Ricky Ross as a full-tilt attempt at rock'n'roll success. One of them said to the other (who knows which to whom, but I'd surmise Ricky to Brian)'You be Billy McKenzie, I'll be Alan Rankine'. The initial lineup featured the Duffin brothers - Graeme, Stuart and Malcolm (guitar, bass and drums), all shown in the, ahem, posed picture - but did not last long. Graeme went on to fame and fortune with Wet Wet Wet and now runs the Foundry Music Labs recording and production studio. His daughter Esther O'Connor is a singer-songwriter. Stuart is now an acclained painter and printmaker. Malcolm, tragically, was killed in a motorcycle accident in the late 80s. 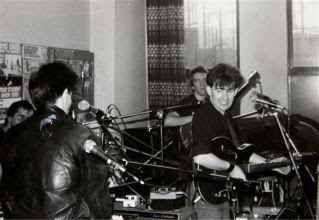 The live shot was taken at a lunchtime gig - I think Woza's first - at Queen's College in Glasgow. By this time it was Ricky on keyboards, Brian on guitar and vocals, plus a rhythm section. That's Ewen Vernal, later of Deacon Blue, on bass. Ricky left to pursue his own path with Dr Love, and later, of course, Deacon Blue. Brian had further versions of Woza, one featuring backing singers Kathleen Higgins and Lorraine McIntosh. Lorraine, of course joined DB and later married Ricky. Brian has released solo albums since, is still performing and is a successful business development consultant based in Glasgow. Talent, said the writer Stephen King, is a blunt knife that has to be delivered with enormous force. Success, said force having been delivered, may or may not follow. Very good books, even books discounted to within a millimetre of break-even, can fail miserably to be snatched from those supermarket shelves. Pop music is a whole different kilo of sprouts, however. Enormous force and vast quantities of cash are routinely used to market, to flog mercilessly, the mindlessly moronic and the half-baked to the momentarily interested. Here today, gone later today: that's pop. It always was this way, and always will be. It's part of the disposable pleasure of the thing. Pop exists as a bubble of memories, a tiny, glistening container of stuff we might otherwise not be able to access. In that way it's like smell. Whenever I catch the heady whiff of embrocation, my entire, brief and hugely unsuccessful rugby career flashes before me. Whenever I hear Sir Paul McCartney's stupidest ditty, The Frog Chorus, a whole chapter of my life (I call it the Summerston interlude) opens up in all its grisly and glorious detail. And as for Zager and Evan's In the year 2525, Mud's Tiger Feet and Lulu's Boom Bang-a-Bang, the pictures they come with are best left undisturbed in the dim and dusty corner of my memory banks. It's got power, pop music, no matter how tawdry it is. As Noel Coward said "it's extraordinary how potent cheap music is." And let's face, it, you don't, you won't ever, get cheaper than Jedward. There's something hauntingly terrible about the two shock-headed Oor Wullies, two out of tune warblers who couldn't guddle a fish if they were starving to death and who'd probably get piles if they tried to sit on a bucket. In case you've ,missed them, they're the twins everyone loves to hate off the X Factor. Which I understand is some kind of television talent contest, an Opportunity Knocks without Hughie Green, but with extra knocks and bigger opportunities. My entire family is addicted to it. I have caught dribbles of it, forced to watch, horrified, often during mealtimes, while my children shout insults at the screen. Some folks are apparently horrified by the X Factor factor in creating superstars from very base materials indeed. One Gordon Sumner, AKA Sting, a 'proper' musician who goes for the lute over the loot (except when he's reforming the band he hates so much, megastar pop-rock trio The Police) is appalled. 'I'm appalled' he says, perhaps because Jedward have ripped off his trademark hairstyle. The one he had when he actually had hair. His point is that musicians like he and his law-enforcing cohorts had to 'pay their dues' by travelling the country in a Transit van and playing horrid toilet-like clubs from Thanet to Thurso, until they were magically transformed into stars by dint of sheer hard work. Meanwhile, the likes of the tiny terrible twins pop up on a dodgy talent show and are suddenly stars, courtesy of the programme's judge, jury, executioner, producer and general big shot, Simon Cowell. But so what? There has always been quality in pop, and there has always been rubbish. For every Phantom Band or Trembling Bells, for every Frightened Rabbit or Harlands (four excellent, musicianly Scottish bands hailing from Selkirk to Wick) there is always going to be a karaoke quine or loon somewhere who can just about belt out a passable Little Boots or Pixie Lott impersonation, and has the looks to jump right out of the telly at your wallet. And maybe their tune, put together by the kind of music factory currently best represented by Xenomania and once by Stock, Aitken and Waterman, will end up lodging itself in your brain, danced to at your wedding, or being on in the background when you propose to your prospective partner. While the Sigur Ros albums you love most remain on the back burner of your brain. I was brought up on a diet of Wishbone Ash and Rory Gallagher, on Yes and Genesis, Cream and Hendrix. I was a guitar solo snob. And yet now I find myself secretly humming along to a Take That or Lady Gaga tune. As for the Sugababes, I won't hear a word against them. Jedward you may be able to take or leave. Personally, I'd rather leave them, but beware. The announcement that your first grandchild has just been born may come while a clip of them is playing on The One Show. Meaning that for decades to come you will think of them with nothing but fondness. You have been warned. This is the Brae bonfire, all set for 5th November: gunpowder, treason, plot etc. The usual stuff. Sunday mornings, the frying pans come out (cast iron, cleaned only in hot water, no detergent) and it's time for The Full Zetlandic. Or The Partial, as I have seen gargantuan Shetland morning repasts which include fried smoked salmon and fried beans, plus of course the fried bannock, sassermeat (saucermeat) black pudding, bacon, eggs and indeed anything else cookable that happens to be in the vicinity. Including lamb's liver, which is, I have to say, delicious. But not with salmon. Anyway, we have a thing about sausages and bacon in this house. We are purists, but not in any TV chefbastard kind of way. We only like cheap industrial sausages, particularly Richmond's Irish recipe. We hate pretentious sausages, particularly those 'Finest' brands you get, which are always full of sour gristle and take far too long to cook. And when it comes to bacon, none of your dry-cured nonsense. Streaky, unsmoked and cheap is best, fried to crunchy hardness. But - and it's a big 'but' - the accompaniments have to be right. No pickles, mustards or chutneys. 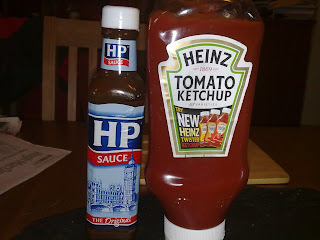 HP Original from a glass bottle (recently re-introduced metal cap is tremendously satisfying in use) and Heinz Tomato from anything (doesn't seem to be affected by plastic).